So, new pattern in hand, I started swatching again. But the new pattern didn't look quite right to me. The cables were lovely, but something was missing. The pattern was called "The Cricket Sweater", and the book was all about tea, and fashions on the subcontinent, which is rather far away from Ireland. Most Aran sweaters have a center panel in a honeycomb or crosshatch pattern, which this one did not. It is a gorgeous sweater, and I may attempt it for myself. But this was not my brother's fisherman sweater. I returned to my multitude of swatches, and decided to steam block them all. Perhaps I could shape them to the desired gauge and move on with my life. After steaming all the swatches into submission, I finally decided on Dale of Norway Freestyle. At over $5 for a mere 87 yards, this would put my raw materials cost for this sweater at $100, not including all the skeins and patterns I had already purchased in my quest. But, he's my brother and I love him. Even if his short stubby neck does require an elusive handknit pattern. He claims this comes from our Irish heritage, along with his barrel chest. Being adopted, I can look forward to skipping those blessings. I went online again, and learned my first source for the yarn did not stock enough skeins for the sweater. In fact, most yarn stores did not. I found only one online store with more inventory than the 18 skeins needed for his size. I ordered 22 just to be safe--extras could always turn into mittens or scarves. The store contacted me to say that while they had plenty of skeins, they were not all the same dye lot. 18 were one dye lot, and the rest were 2 other different dye lots. Now, the idea of a "dye lot" on undyed yarn seems strange at first--the color for a traditional Irish fisherman's sweater is "natural". Not bleached white, just the color of the wool as it comes off the sheep. I suppose this just means that color varies from sheep to sheep. If you gathered up 12 blondes in a bar, excluding the peroxide-enhanced ones, the color of natural blonde would still vary. So too with sheep. As I was double-checking to be sure I was marking the correct number for each instruction, I noticed that I had made an error. Instead of reading my brother's girth in the row asking for "Fits Size:", I had read it in the row marked, "Finished Size:" HORRORS! This error meant that I was instead knitting a sweater that would be exactly as wide around as my brother--no give, no ease. It would fit him as tight as a nice warm, wool sausage casing! UGH. Reading the chart correctly this time, I realized I needed not 18, but 23 skeins of yarn! And my "etail-er" did not have 23 matching dye lot balls of yarn! In a panic, I emailed her anyway, and all my knitting friends. We debated knitting one sleeve or one cable in the smaller volume dyelot, or the back vs. the front. It would be doable, and in indoor lighting, should not be too noticeable. I was already facing the frustration of having to rip out the knitting I had started to reknit at 129 (not 111) stiches. AAARRRRGH! My e-tailer called all her knitting store contacts to try to find more yarn in that dye lot. I emailed every online store I found with any of the Dale of Norway in stock, asking them to check their yarn wrappers. I posted a plea on Ravelry listing the yarn, brand, and dye lot, hoping for a miracle match. When my original store called me back, she said the news was not good. The poor economy was driving a lot of smaller and independent yarn companies out of business, and deliveries from Dale of Norway were getting irregular. Being manufactured in Europe, there was no telling if there was any way to get more. Resigned to clever hiding of the color change (which was visible in good light), I cast on and knit away. I ordered the remainder of her available stock, thinking that blending more shades would fool the eye better than just 2 which might look stripey. I got an email from one online vendor who specialized in Dale of Norway. She offered to contact the North American warehouse distributor for me, to see if they had full bags (20 skeins) in matching dye lots left. Having already spent $250 on this quest, I couldn't imagine spending another 100 on more yarn, so I politely declined her offer. But as I kept knitting, trying to regain the progress I'd made on the inadequate 111 stitches before, I couldn't let go of it. 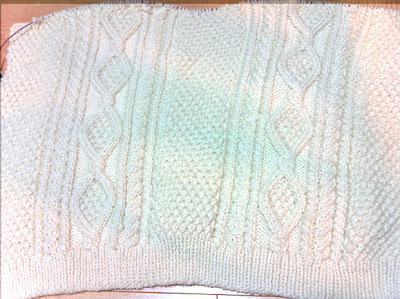 It bugged me to have to knit cleverly to hide the color change, and so decided it would be worth it after all to try. She called the warehouse, confirmed they could ship her 40 matching skeins of natural, and we negotiated the price. She gave me the full bag discount on the first 20, and then sold me 8 more skeins at regular price. She would keep the remaining 12 in her inventory. My new total on the sweater? $370. OK, I exaggerated with $500, but I am not closing the books on this until the dang sweater is on his back! So, now I have enough undyed yarn on hand to knit 3 Aran sweaters in varying sizes. What matters, though, is that the one for my brother is going to all match. One sweater, one sheep. That's the right way to do it. 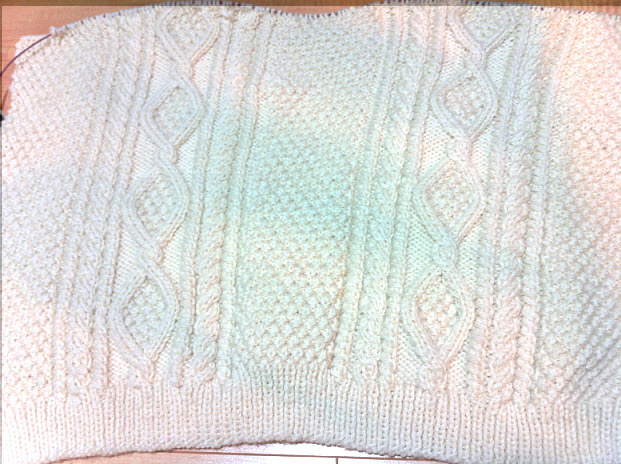 Finally, here is a picture of the sweater, or at least the start of the first piece. I've told my brother to stay healthy for a long time, as this will take a while. It's already been almost a year since I started on this project! 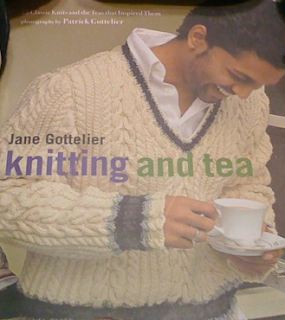 All this, because I can't knit him the kidney he really needs. I love this story and I love this sweater... well, the part of the sweater that you've finished. I can totally sympathize with incorrect reading of patterns and feeling like you've double and triple checked everything only to find it's still not right. Very frustrating. But your brother will appreciate it all that much more, right? Can't wait to see the finished product! Gorgeous sweater. May your brother's health improve so he can cuddle for years in it. I'd know you anywhere, Little Drummer Girl ;-) I checked out the link. Didn't see a kidney on there, but even if there was one, I doubt the blood types would match. The uterus was mind-boggling. Cool, but what do you do with something like that when you are done? Make a mobile? @PMG Smith Family, thanks for the encouragement. And nice to have another reader/commenter.